How to find cheap flights to Mombasa? This page lists my six best tips to find them. It will take some time, but following these strategies may save you hundreds of dollars - or even more! The air industry can have tremendous price differences. So you may save a lot by comparing as many airlines as possible. Travel comparison websites make this very easy. My two favorites are Kayak and Vayama. Kayak.com compares over 140 airfare sites for the cheapest tickets in seconds. So you don’t have to visit all these sites yourself. Vayama.com compares the best deals from over 100 sites and is especially geared to travelers from North America and Europe. There are no direct flights to Kenya from North America or Australia. You’ll have to get a connecting flight in Europe, the Middle East or even Africa or Asia. This means it's sometimes cheaper to get tickets from different airlines for parts of your itinerary, e.g. a cheap ticket to Europe and from there the lowest air fare you can find to either Nairobi or Mombasa. Besides the simple fact that organized tours are just easier to book, you can find that the flight costs are also reduced. Chartered tour groups can buy up blocks of seats (and hotel beds), giving them a bulk discount. The package is often cheaper than if you would buy the parts separately. Do calculate everything well before booking. The advantage can even be bigger for you since most scheduled air services fly to Nairobi, while some chartered flights also fly directly to Mombasa. This means no extra ticket costs for you. Cheap flights to Mombasa (as well as any destination) can be found easier if you look for the less popular days and times to fly: off-season dates, Mondays to Thursdays (as opposed to Fridays to Sundays) and flights on inconvenient times (e.g. very early in the morning or at night). Most people want to fly during weekends, within the tourist season and on decent times. So flights are more expensive then. However, always include a weekend in your itinerary. If you leave and come back within the same working week, airlines assume you’re a business traveler who can afford to pay more. Air fares tend to go up as the date of departure comes nearer. So booking early gives you the biggest chance on getting cheap flights to Mombasa. I often book 12 to 6 months in advance. On the other hand, an empty seat in an airplane is worthless on the moment it’s airborne. Days or even hours before departure, air fares may drop considerably. It’s a risky strategy, since you don’t know if there will be seats available, and airlines usually practice overbooking. So you better limit this to occasions where you have more options on your wish list. 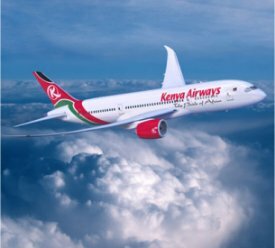 The national airline in Kenya is Kenya Airways. It's a respected quality airline and they service all major cities in Africa, as well as destinations in Europe, the Middle East and Asia. 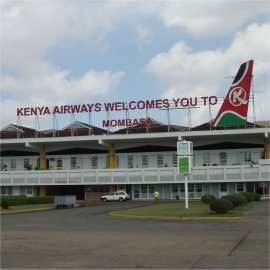 Since Kenya is their hub, always check with them for cheap flights to Mombasa. As said, if you need a connecting flight from Nairobi to Mombasa, it also pays off to check with Africa Point, the leading aggregator of domestic flights in Kenya. Whether you fly directly to Mombasa or take more than one flight to get there, you're probably going to end up at the Moi International Airport, that's located in the north-west end of Mombasa. It's not as large an airport as Jomo Kenyatta Airport (in Nairobi), but still offers basic airport services such as currency exchange, a restaurant, tourist information, a duty-free shop and long-term parking facilities. I think this page proves that cheap flights to Mombasa are possible if you're willing to invest a little time. Happy hunting!